LONDON - The IPA is calling on all of its agencies to upload their Christmas ads, games and cards to a creative website to showcase their Christmas work to clients. Agencies are being encouraged to submit their festive offerings over the coming two weeks. Nigel Gwilliam, IPA head of digital, said: "What better way for agencies to showcase their work, and particularly their Christmas creativity, than to post it on a site viewed by agency peers and crucially by clients. "We also hope that the new ‘Christmas work’ section on AOBW will provide some much needed cheer to its users during these tough times. Instead of producing its own Christmas card, the IPA will be promoting the Christmas AOBW website to clients from 1 December. The site is for IPA agencies, but everyone can view and comment on the work. 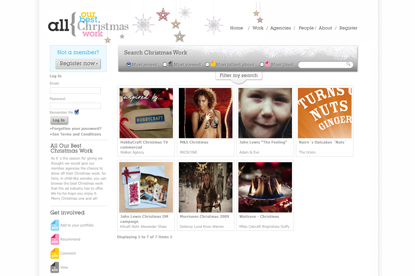 Agencies can also submit their Christmas work to Campaign magazine by emailing colin.marrs@haymarket.com.